I'm here but I'm also there . . . Some simple copic coloring is really all I did besides adding some simple dots. These flowers did it all for me. Really nice of them wasn't it ? 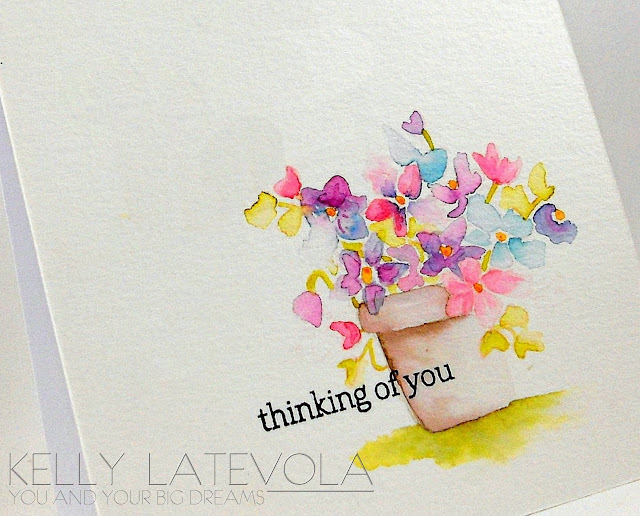 I am also sharing a bit of watercoloring over on the A2ZScrapbooking blog. SSOOOOOO pretty Kelly! You are a coloring genius!!! Wow, you are really rockin these cards! I'm lovin' all the gorgeous flowers! Beautiful cards both. So talented, love your flower cards. Off to check out the other one now. Really nice of them, Kelly... and you've done a stunning job of "watering" them! Very beautiful! Gorgeous work, Kelly. You are one amazing colorist. Wow! Off to check out the second one! Your card designs and coloring techniques are amazing!! I just started following your blog! You're an inspiration, Kelly! OMG, what a card! I LOVE those bright flowers. And that second watercolor card looks amazing, too. Those big, bright flowers are beautiful! And your watercolored card is amazing! So pretty! I need to learn to manipulate and control color the way you do - awesome and so beautiful - both of these are outstanding - one bold and so vibrant, the other so soft yet stunning!! These are stunning cards!!! I love how you used the colors on the first card. So bright and cheerful. I love the strokes on the leaves and the little dots you did on the flowers. I just want to touch them!! Then you toned it down for the second card-so masterful. I so wish I could color like you!! Pretty cards! I especially love the peek of the watercolour one!